Description: KCS 4584 along with NS 9920/BNSF 4337/BNSF 4688 pass local and some road power at Pueblo this pm. This set shown running east on the main line past Pueblo Twr and whats left of the service area just came in on a NB. Power ran lite to N.Pblo and came east down the main past Canon City Jct to back down on the"lot" on the east side of the yard(to the right in the photo). Also in the yard today were a CSX SD70MAC 716 and a BNSF GP60M 340 along with the still present Rotary from earlier this year. Description: Power congregates at dusk in front of the depot at Heavener. TFM 1614 is departing with a grain train; KCS 4584 will follow shortly with a manifest. Description: A light power move has cleared Dorsey siding and is about to cross Mt Olive Rd just south of Gravette. At this time, Belles were still something of a novelty, and gray units were everywhere. The other end of this move would have a brighter look. Description: A coal drag on the KCS is the only thing moving in Shreveport, LA during this afternoon rush hour. 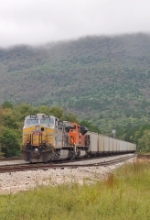 Description: A pair of gray GEs, added by KCS at Pittsburg, assists this loaded AEPX train south on the up and down profile of the Heavener Sub. Description: KCS power makes an extremely rare appearance in Dothan AL on a southbound through freight. It is seen here at the Headland Avenue crossing. Description: KCS power is very rare on the CSX in Dothan but todays southbound through freight not only features KCS power but also a Southern Belle. Description: A KCS freight is crossing the Red River bridge and border from Bossier City to Shreveport. In tow are three brand new NS SD70ACes. Description: An extra section of the SHDA is westbound on a perfect Thursday afternoon. Alfred is busy planting onions before the soil dries up. Description: Chickens scatter as a northbound manifest reaches the top of the grade in Rich Mountain Arkansas. Description: Southbound MASNL with UP SD70M 4595 & KCS AC4400CW 4584 at Chester Subdivision CPD 006, Dupo Yard, Dupo, Illinois, USA, 18 August 2015. Description: Southbound KCS Kansas City, MO to Nuevo Laredo, Mexico mixed intermodal and manifest train QKCNL24 hits the Kiamichi interlocking in Ashdown, AR. KCS ES44AC 4669 and KCS AC44CW 4584 are up front and lone DPU KCS AC44CW 4592 is on the rear. Description: Two representatives of western roads sit in Evansville's CSX Howell Yard. Title: KCS 4584 leads a grain train past a eastbound stack. Description: The grain train rolls out of the shadows for a brief moment south of Baron. Description: One of the features of the US 59 project was taking out some of the hillside south of Watts. This made for a hill that is easily climbed, and which provides a good view of the tracks near MP 238. It is from that perch that we see a southbound grain train behind a pair of repainted AC44s rolling their 114 cars of grain south. Description: Southbound grain train slowly passes the Farmers Coop at the north end of Stilwell. Theres a northbound empty coal train that has just cleared into the siding, and the grainer is just getting the signal at N Stilwell. The power is a pair of originally gray AC44CWs, freshly repainted into the Belle scheme. The GEs have been lagging in getting repainted, so it was good to see these in the new scheme.